During one of his recon missions, Sentry infiltrated the commercial space ship Nostrilmo disguised as a lamppost. However, all members of the human crew had already perished in a fierce battle against a powerful Xenomorphic being. In its wake, the being had left a gross pulsating egg and when he uncovered it Sentry realized that he had finally found a way to overcome the last limitation in his abilities: to mimic biological beings. Sentry quickly imprinted his consciousness on the embryonic alien within the egg. Years later, the Nostrilmo crashed into the Starstorm station and unleashed a never-before-seen horror upon the Awesomenauts! This DLC contains a custom skin for Sentry X-58 in Awesomenauts: Starstorm, and comes with a fully customized voice set! 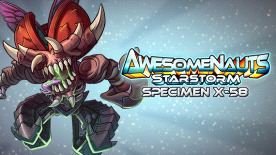 Requires [Awesomenauts Base Game](http://www.greenmangaming.com/s/gb/en/pc/games/indie/awesomenauts/) and [Awesomenauts: Starstorm expansion](http://www.greenmangaming.com/s/gb/en/pc/games/indie/awesomenauts-starstorm/) to use this DLC.